Tag "Hal Jordan, Green Lantern"
For all its faults, the recent Hal Jordan and the Green Lanterns Corps was far better than the crap Grant Morrison is currently feeding us. DC tried to fix the Green Lantern franchise, but only made it worse. Once upon a time, the DC Universe was rich and varied, but in recent years, it seems DC Editorial has tightened the reigns on characters and franchises which might fall outside the primary continuity. Somehow, the notion of something existing in world without Superman and Batman became… undesirable. Such properties include the Warlord, Sgt. Rock, Jonah Hex, and the Legion of Super-Heroes. One might argue that these properties no longer have a market, but in the case of of the LSH, legions of fans would strongly disagree(pun intended). So instead of actually publishing a new LSH title, DC instead coyly features aspects of Legion lore in other titles. 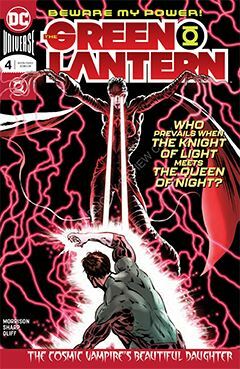 In recent years, the Green Lantern titles have featured the Dominators, and in this week’s issue of The Green Lantern we not only have the Sun Eaters, but also a clumsy cameo (Wink. Wink.) by Legionnaire Dirk Morgna (look him up). Adding to this patronization is an awkward storytelling technique, in which two criminal-type characters share a narrative in which the GL encounters the aforementioned Sun Eaters, leading to a dramatic change in Hal Jordan’s status in the Corps. I can safely say I am spoiling NOTHING when it is revealed one of this unsavory criminal types is exposed as Hal Jordan. But the BlackStar he is speaking with seems to be already aware of that. As were we all. There is another plot point I can’t explain without giving much away. But I will go so far as to say that if Grant Morrison thinks he can convince us that Hal is not undercover, then his reputation is considerably tarnished. His narrative choices in this issue– telling a disjointed story from two different perspectives – does nothing to impress me. But honestly, he’s never impressed me. Your mileage may vary, but I doubt by much.